Let us share a little with you on why we love plus and fat wheeled bikes. Mega traction, control and comfort are just a few words we use when talking about these bikes. We LOVE fat bikes. They are super stable and super grippy over roots and rocks and float over snow, sand, mud(pretty much anything soft). Most of all they are SUPER FUN. Now there is an even NEWER evolution to this segment, the PLUS SIZE bike. Some call them half fat bikes but we just call them "freaking awesome". They have all the big tire benefits but an even more adventurous soul. Here are a few recommendations from some cool companies. Don't see what you are looking for or have a question? Just give us a call. 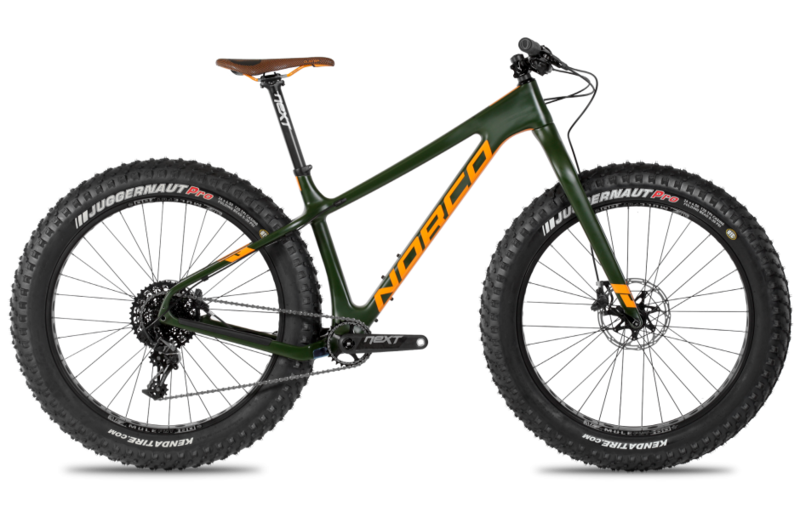 Torrent is Norco’s first ever 650B Plus trail mountain bike. Designed from the ground up with Trail geometry, 45mm rims, and 3” tires, the Torrent is an aggressive hardtail mountain bike with a quick but stable manner that will have riders whooping with joy on flowing singletrack, dominating rocks and roots on technical downhills, and tackling steep, loose climbs with ease. Novice and experienced riders alike will benefit from the increased traction and control of the Torrent. A brand new model for 2017, the Torrent FS+ is our first ever 650B Plus full suspension bike. Designed from the ground up with aggressive all-mountain geometry, 130mm A.R.T. suspension and trail-taming 2.8" wide tires, the Torrent devours everything in its path. Conquer gnarly root sections, float over rock gardens and claw up steep, loose technical climbs with ease. Fun and aggressive with traction in spades, the Torrent FS takes all-mountain riding to a whole new level. The Fluid FS & HT 7+ are the perfect trail weapons. With no-compromise geometry designed around 650b plus wheels, the Fluid 7+ is optimized to get maximum fun out of every trail you ride. The trail-tuned A.R.T. suspension and short, stiff rear end will have you snapping around corners, exploding up technical climbs, and flowing through rocky, rooty descents. Take your trail riding to the next level with the Fluid 7+. The Marshal experience is all about taking the unorthodox and owning it. It excels in mixed-bag elements and storms varied, unforgiving terrain with the multitasking muscle of Devinci’s Optimum G04 Aluminum frame paired with proven Split-Pivot suspension. Intuitive frame architecture clears mud quickly—thanks to XL openings below the shock’s lower attachment. Surefooted 27.5+ wheels enhance traction on slippery surfaces and deliver appreciated stability. And Boost 148 axle spacing in rear, 110 in front, bolsters stiffness for superior handling meets massive pedal power. Charge hard with bikes equipped for one itching desire, to go anywhere and everywhere the others won’t. In order to live up to the legendary Blizzard name, our goal was clear: create a true “mountain-bike-feeling” fat bike. With suspension-optimized design, progressive geometry, and a truly capable parts specs, the Blizzard delivers Rocky Mountain ride quality on snow, sand, and anything else you get yourself into. We designed the Blizzard with a shorter- than-average top tube to keep it nimble, and wide 4.7” tire clearance for maximum float on soft terrain. Engineering for a suspension fork required optimizing for the additional length while providing an aggressive 68.5° head tube angle. The bike that is dumbing down the gnarliest trails that BC has to offer is the Pipeline. The confidence of plus-sized tires in raw, technical terrain is now available in an aggressive trail chassis. The new Pipeline plows through greasy roots and square-edged chunder with authority, while providing near limitless traction on rocky, slippery climbs. Haro's new 2016 27.5-inch Plus bike line lets you experience increased comfort, traction and confidence over any type of rough terrain. Enjoy incredible traction in turns and shorter braking distances whether onboard the Subvert hardtails or the dual-suspended Shift Plus. All our 27.5-inch Plus models feature light and rigid tubeless ready WTB wheelsets with Scraper rims, Trail Blazer 2.8" or Bridger 3.0" tires, TCS rim strips, packaged in a nimble and fast Trail geometry. Krampus is the evolution of the 29er. It’s not a fat bike, half fat maybe. True, its got 3” tires on 50mm rims (we call this combination “29+”). But where fat bikes are really designed for slow-speed crawling, Krampus’s frame (geometry, tubing diameter/thickness) has been designed with a long toptube and as short a rear end as we could get away with given the wheel/tire size. This, when combined with the big, wide tires, results in a mad amount of rolling inertia and grip. It rips and responds well to body English. The big tires also offer a bit of suspension-like cushion. Krampus is a trail bike that also tackles all kinds of terrain. Krampus lives somewhere between bushwhacking, speed racing, and back lot dirt track riding, and all this makes it just plain fun to ride. Some may remember a Surly model we discontinued called the Instigator. The Instigator was a burly hardtail made for going fast and going big. Our new Instigator picks up where that one left off. This thing is beefy and tough, yet quick-handling and well balanced. This new Instigator differs from the old one of course. Most notably, Instigator 2.0 is what we call 26+, designed to run 26˝ (559mm ETRTO) Rabbit Hole rims. At 50mm they’re quite a bit wider than standard MTB rims, and coupled with our 2.75˝ Dirt Wizard tires the overall diameter is about 27.5˝ (roughly 650b). All this means you get loads of traction and cushion yet you can still accelerate like mad. The toptube is long and the wheelbase relatively short, with a nice front/rear balance. This thing is made from the ground up to swoop, rail, hammer, drift, carve and fly. It goes downhill like nobody’s business and climbs well too. Pick your poison. No matter what size you run, geometry remains optimized thanks to a neat little “High/Low” setting on the upper link that flips to adjust bottom bracket height*. Hightower’s 67° head angle, longer reach and trim chain stays combine to create an altogether different class of dreadnought in any configuration. 11nine Epicyon's fixed pivot rear end is sure to please with 110 mm of pure travel. The lower piston shock barrel mounts back to the frame just above the bottom bracket. Want a more traditional mountain bike feel - then this is it. Reaction to the bumps and jumps is just a little stiffer, but you're still going to love it. Jones Spaceframe – Why this bike? It's a high performance non-suspension bicycle... instead of designing the bike for XC-racing like so many unsuspended bikes I wanted this bike to be better for technical and distance riding... Since this bike is not designed around a suspension fork I'm able to do much more to improve the handling. By designing the frame and fork together and considering the larger wheels I'm able to make a bike that rides very differently to a 'normal' rigid bike (be it 26 or 29er) with a short rake fork. The Foes Mutz is a Fatbike with racing pedigree. The smaller but nimble little sibling to the Mutz fat bike. The Foes Alpine+ brings a new tire size that is meant to bridge the gap between standard mountain bike tires and Foes Fat Bikes. Naturally we had to start with a clean slate, the head angle, BB height, and chain stay length had to be perfect with the new BOOST specs. The 2.3:1 leverage ratio gives you a nice rising rate 5"or 5.5" travel position. The Alpine+ is the perfect bike to take you on trail that other bikes would have problems and give the confidence and control.